I recently had the most lovely pleasure of spending a weekend in Portland, ME celebrating my upcoming nuptials (#kaydoniwedding). 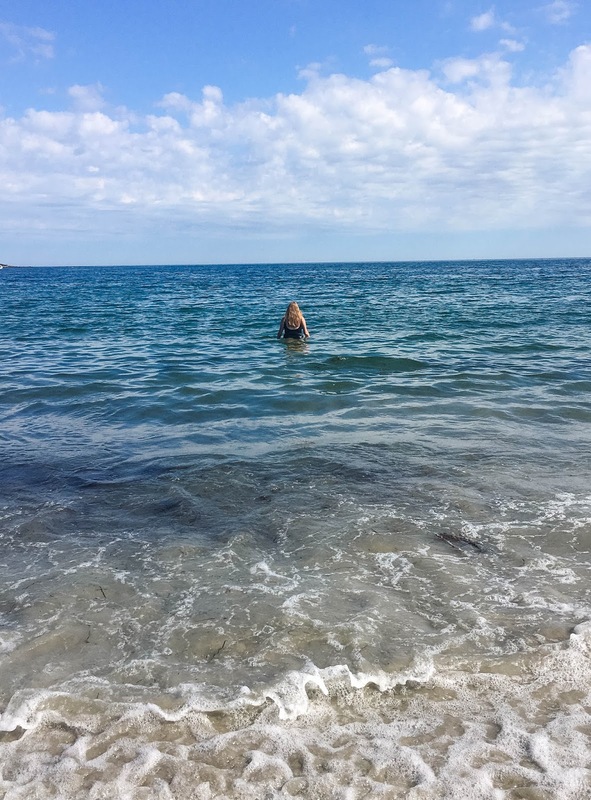 Some call it a bachelorette, others call it a hen party, and I called it all that and a much-needed weekend away from the hot and sticky mess that was New York in the summer. Portland turned out to be the perfect destination for the weekend - for a myriad of reasons, I wasn't interested in embarking on a traditional bachelorette evening of shots/strippers/sequins/stilettos (and honestly I got more than a dose of that kind of night two weeks later in Chicago...but that's another story for a much other time). Instead, I wanted a little bit of everything - good food, craft beer, fresh air, and ocean views. And since Kristen had recently moved to Boston, Portland turned out to be relatively easy to get to - Claire and I took a train to Boston (no more Bolt Bus for us!) and then drove with Kristen the remaining two hours to Portland. We rented an Airbnb for the weekend. 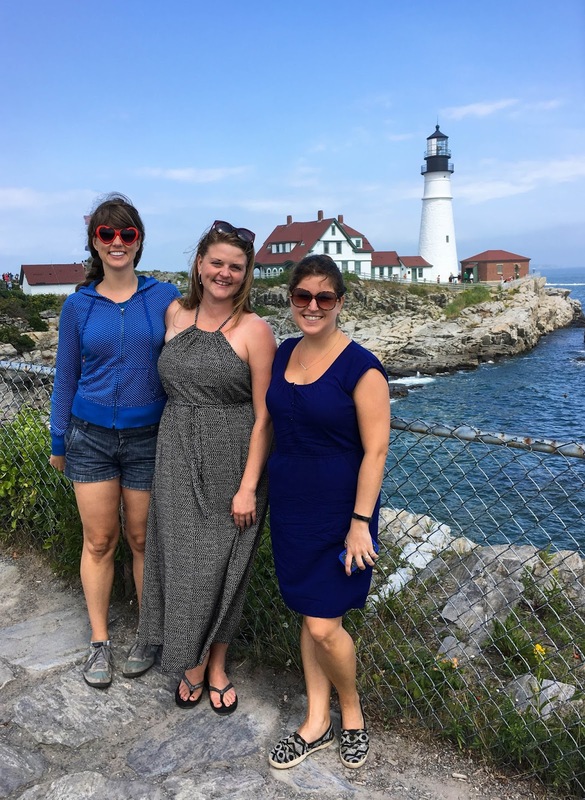 While there were a handful of really cute boutique hotels in downtown Portland we would have liked to use, we couldn't get our act together and by the time the three of us gathered to organize the trip, everything had been booked for ages. 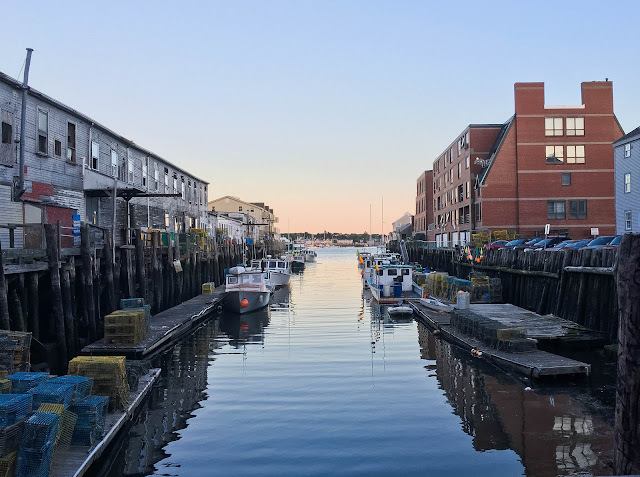 Luckily though, we found a fairly affordable attic apartment available for rent, and since we had a car, we were able to stay outside of the downtown area in the quiet and residential South Portland. I wouldn't recommend that area for anyone without a car though. It would have been a 45 minute walk to downtown, and though Portland itself is extremely safe and walkable, that's not a trek I'd want to make at midnight. 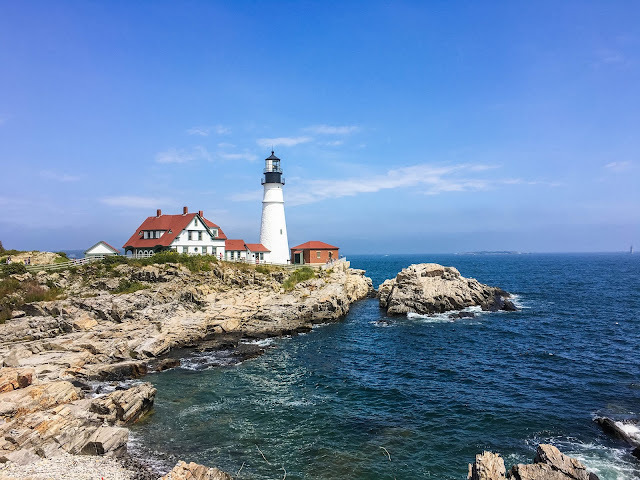 I tried my hardest to not pre-organize every minute of the weekend as I am wont to do while on vacation, but one of the sights I definitely wanted to see was the Portland Head Light, the oldest lighthouse in the state of Maine. 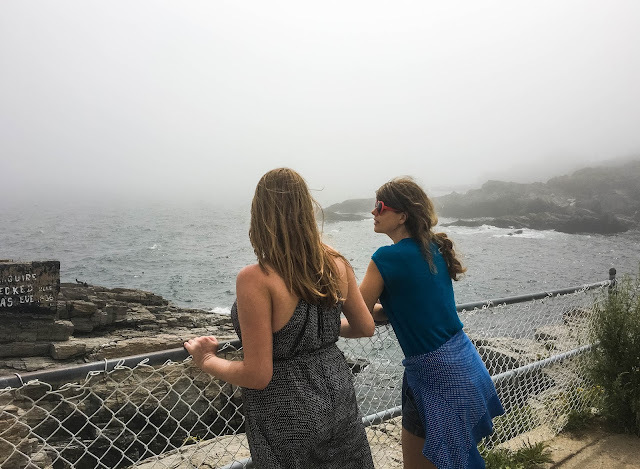 Situated on the beautifully maintained coastline, the lighthouse and the surrounding walking paths, beachfront, and gardens are all free to visit. 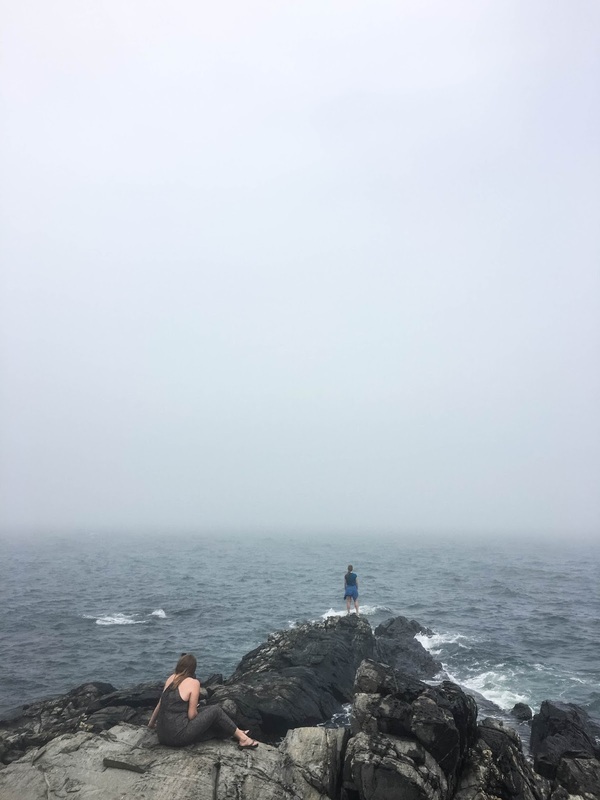 We spent over an hour wandering around the area, and when the fog rolled in from the east we used the moody scenery as inspiration for few moments of quiet seaside introspection. We ate and drank like kings queens all weekend long. In addition to artisanal pizza, craft beers, fancy cocktails, and the best donuts I've ever tasted (really, the only donuts I've ever even liked), we sat ourselves down at a roadside shack called Fisherman's Grill and ordered the. best. lobster. rolls. ever. While most lobster rolls need to add globs of mayo and/or butter and/or a bunch of other random veggies to make up for lack of lobster meat quality, what we ate was pure, fresh, lobster and little else. We barely spoke as we savored our rolls, and even though they were gigantic (the three of us split an extra large order with three buns) we still found room for a shared cup of clam chowder and a huge order of the silkiest and most flavorful scallops I'ver ever eaten. We also found time to lay out on the beach. Even though clouds threatened our lighthouse visit earlier in the day, the notoriously mercurial Maine weather cleared up in the afternoon and allowed us to have a solid three hours on the beach at the nearby Two Lights State Park. I did, however, underestimate my ability to withstand cold water. Boasting that "the cold doesn't bother me" because four years ago I swam for hours at a beach in New Hampshire, I was quickly shown up by both my friends and everyone else at the beach when I put one toe into the freezing cold water and immediately ran shrieking back to my towel. 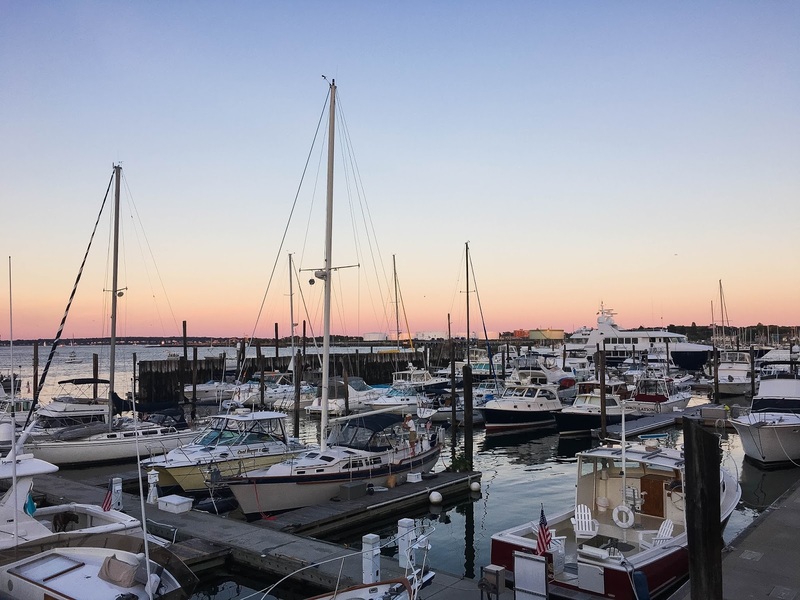 Where to stay: Portland has a handful of lovely hotels, both chain and boutique - but we opted to stay in an Airbnb in nearby South Portland. Looking to book your own weekend getaway? Use this link: www.airbnb.com/c/mspadoni3 to get $35 off your first stay! What to do: Downtown Portland is easily walkable and navigable and home to a ton of cute shops. If shopping's not your thing and want a breath of fresh air, the nearby Portland Head Light and Two Lights State Park have walking trails, beach access, picnic areas, and great views. We also stumbled up on the Portland Farmer's Market and spent a happy hour oohing over giant tomatoes and taste-testing fresh cheeses. 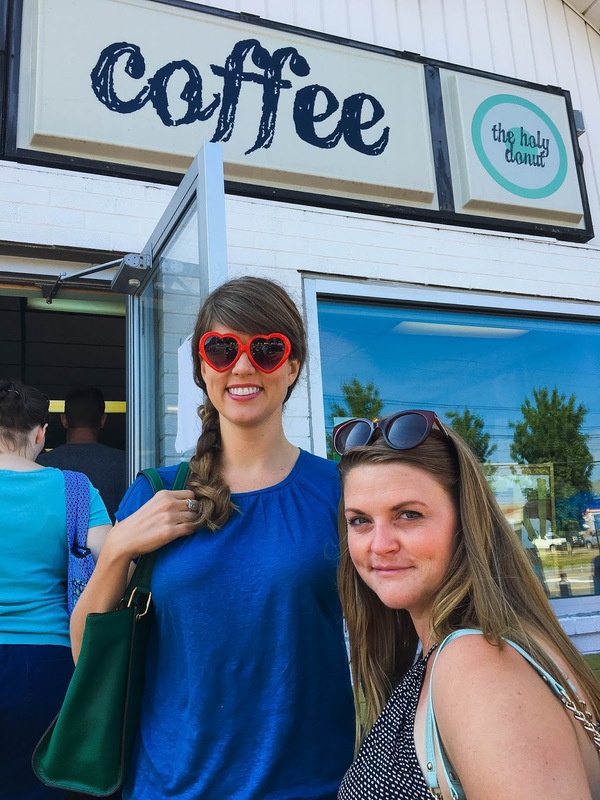 What to eat: I had some of my most favorite meals in Portland. In no particular order, I can gladly recommend Otto's Pizza, CIA Cafe (in South Portland), The Holy Donut (go to the Park Avenue location, order at least three Dark Chocolate with Sea Salt donuts, and savor them at Deering Oaks Park across the street), and Fisherman's Grill for a lobstah roll and all the other fresh seafood you can manage (be warned: it's cash only and expensive - but beyond worth it. Just fork over the money and stop complaining.) Also: we never made it to Duck Fat but I swear on my next lobster roll that I'll get there one day! What to drink: Novare Res Bier Café has an outstanding beer menu, The Bearded Lady's Jewel Box has an impressive cocktail menu that was almost too hip for us 30-somethings, and the Armory Lounge in the lobby of the Regency Hotel has an old-school old-man vibe that turned out to be exactly what we needed for our final nightcap of the trip.